It seems crazy to me that Ditka's #89 Chicago Bears jersey was retired 50 years after he helped George Halas win a Championship in 1963. Winning a Super Bowl in 1985 as the Bears Head Coach, Ditka is often forgotten as a Hall of Fame Tight End. With the reverence that the city of Chicago holds for Ditka, I was shocked to see his jersey retired in Monday night's game against the Cowboys. I'm not surprised that the Bears retired the jersey, only that they retired it in 2013 rather than decades earlier. Ditka has been a franchise symbol for a long time and has enjoyed both success and notoriety for his brash persona and his tough-as-nails reputation. While his temporary foray into coaching the New Orleans Saints in the late nineties was forgettable to say the least, he absolutely remains a Chicago Bear at heart and a critical part of the team's illustrious history. 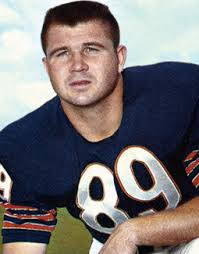 Ditka won a championship with the Bears in 1963 during his five seasons in Chicago, before playing for the Eagles and then finishing his career as a Cowboy after the 1972 Super Bowl victory. Ditka then was an assistant coach for Dallas, and was part of the 1977 Super Bowl championship team. In 1982, the Bears hired him as their Head Coach, and he proceeded to win the Super Bowl again in 1985. Ditka left the Bears in 1992, then retired completely after coaching the Saints from 1997 to 2000 with a career record of 121-95. Ditka was the first tight end to be inducted into the Hall of Fame, and he is the only person in NFL history to win a Super Bowl as a player (1972), an assistant coach (1977), and as a Head Coach (1985). While the Cowboys likely view him highly for his time in Dallas, Ditka is always going to be a Bear. Congratulations to "Da Coach" for a wonderful career in the NFL, and for receiving yet another well-deserved honor, firmly entrenched in Chicago Bears history.